What an honor to be featured in BRIDES MAGAZINE AGAIN this month in their current Aug/Sept issue! One of their editors reached out to get etiquette advice on how to deal with the budget and bar. How would you deal with this? The world’s largest bridal magazine, BRIDES MAGAZINE is the go-to source for all things wedding. Flattering gowns, creative reception ideas, planning how-to’s, DIY stories, color palettes, amazing flowers, inspiration boards, gorgeous hairstyles, etiquette advice, fun honeymoon spots, Brides has it all. We are BEYOND honored and thrilled to have been featured as an expert in the magazine’s December issue! 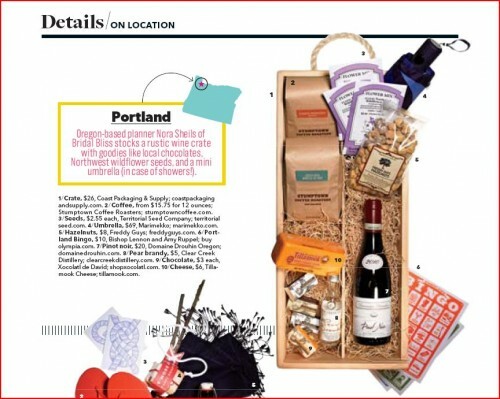 Take a peek at our take of a fabulous NW themed welcome bag…hope you like it!